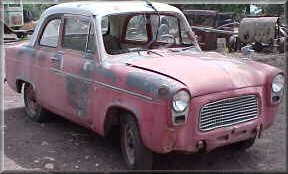 This is an ANGLIA By British Ford built between 1958 & 1961. A 95% complete car for restoration. Missing are the front bumper & windscreen, however that is all that is missing, all the door hardware and instruments are present. This is an Arizona car with almost no Rust. It starts and runs, the engine just purrs. This is the model people make race cars out of, hate to see that happen but it is for sale. Some of the numbers we found. Model 101E 450E/63726 TC/688/AN 100F 725977.